- Material Used : Sealed Gear Box, Hopper Spun From Alu/ Ms Sheet. Interested buyers for Hand Rotary Duster can contact us. - Light in weight and sturdy in special quality make. - Suitable for effective and easy application. - Delivery pipe with deflector. - Sealed gearbox with oil less bearing so lubrication is not required. For control of pests and diseases by use of chemicals in the dust forms in nursery, vegetable gardens, field crops, tea and coffee plantations etc. ALAP shoulder mounted duster is simple but sturdy in build combined with lightness in weight. Capacity: is 6 Litres and has field capacity of 0.6 ha/day. 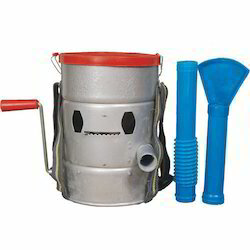 These dusters running are ideal for economic, effective and easy applications of powder to control pests and diseases in field crops, plantations and godowns etc..
Super built for Control of Pests and Diseases in Field Crops, Tea and Coffee Plantations and Godowns.Simple & Robust Mechanism to give years of Troublefree service. Well balanced to rest comfortably on shoulder & belly. Fitted with Breast Plates. Regulator to Control flow of Dust. 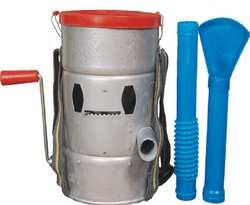 The Belly Mounted Type Hand Rotary Duster range is used for dusting pesticides in powder from on field Crops.